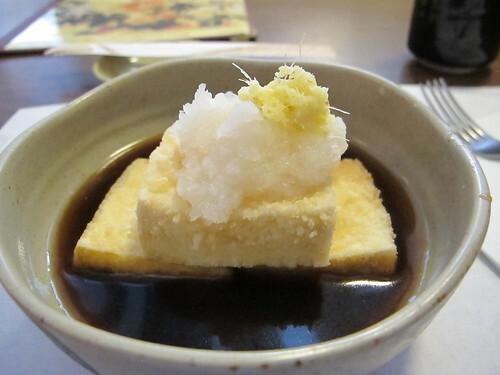 Agedashi tofu, I had one thing on my mind as I drove from Nashville to Jackson and that was the perfectly fried blocks of tofu in sauce that is known as agedashi tofu. Of course, the question was where do I find such a dish on the road to Jackson? Passing through Memphis in time for lunch, I decided to eschew the teppanyaki tables and fusion menus and look up a stalwart of Japanese cuisine in Memphis, Edo. In business since the mid 80s, I could only hope that there was more than convenience and blind customer loyalty keeping this restaurant open. I’ll get this subject out of the way, yes, Edo does appear to be situated in quite an unsavory location. A sign warning patrons to not leave valuables in their cars is never comforting but it would be unfair to dwell on Edo’s Summer Avenue address. Much of my time in Atlanta is spent on Buford Highway and while its 90s reputation of gangs and drug dealing may be fading quickly, it’s still not exactly prime real estate. With that out of the way, I was curious to see what Edo was like on the inside. There’s something delightfully kitsch about the combination of drop ceilings and shoji screens. It’s as if Edo was initially decorated on a tight budget and things haven’t much changed since opening day. More important than the décor was the menu and in the tofu section, I saw my prize. Simply prepared, agedashi tofu has quickly become one my favorite litmus tests for a Japanese restaurant and Edo takes a unique approach with their version. I’ve read recipes that call for a topping of grated daikon and ginger but this is my first time to encounter it in the flesh. While the ginger added an extra pungency to the agedashi tofu, I was surprised at the thickness of the batter; it didn’t seem like the usual corn starch coating. 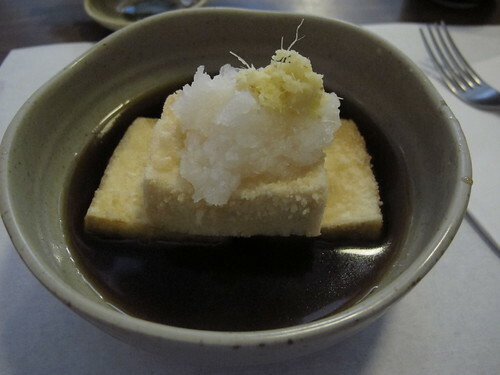 The tofu’s texture was also a departure from the norm as it was certainly a firmer variety than the usual silken. Rounding out the unique version was a sweet sauce that seemed heavy on the mirin. 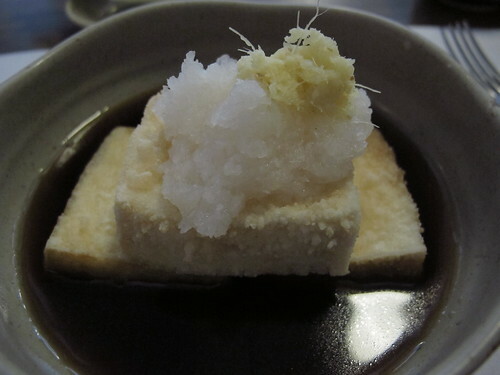 Although I missed the unmistakable taste of a katsuobushi topping, this agedashi tofu still satiated my cravings. 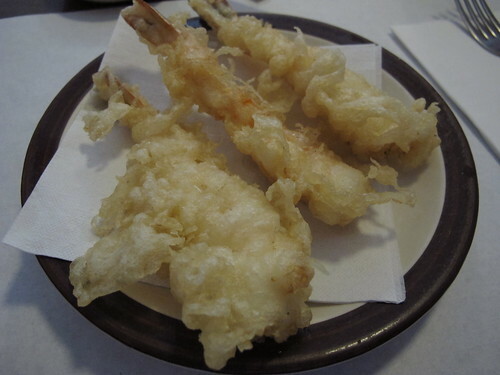 Shrimp tempura, a dish where gluten is the devil, was next. 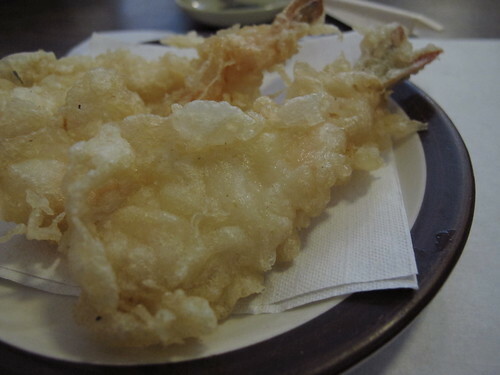 Edo’s tempura had a delightful popcorn crackle and crunch to the batter. While not too greasy, there did seem to be more batter than shrimp. The shrimp that was there was still quite well fried and paired well with the sweet dipping sauce. 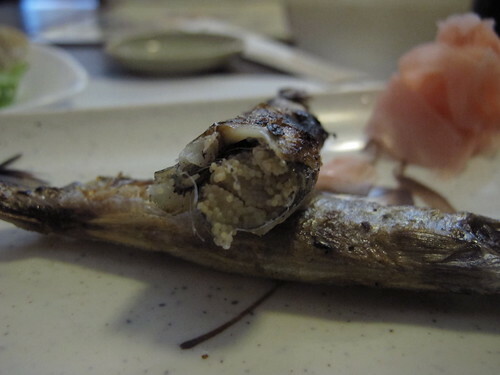 Guaranteed to make a first time diner a little apprehensive, shishamo is worth much more than the simple shock value. 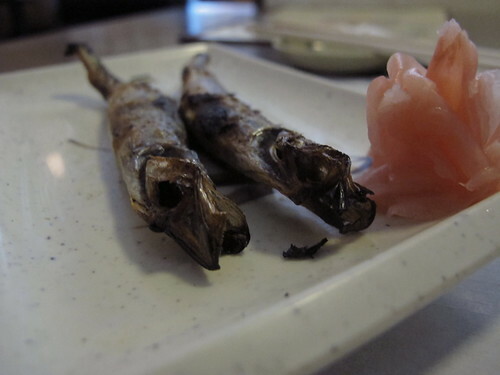 Fresh from the broiler, these willow leaf fish were expertly cooked. These examples were brimming with tender roe. 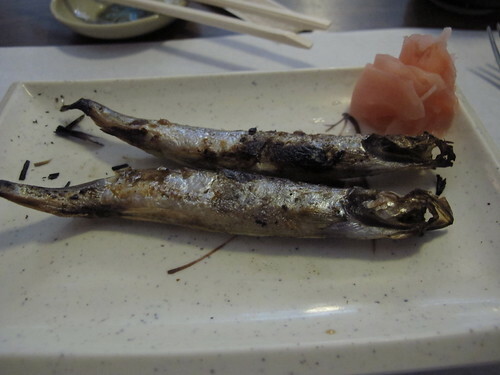 Eaten whole, they were salty, a little fishy, a little oily and, frankly, delicious. 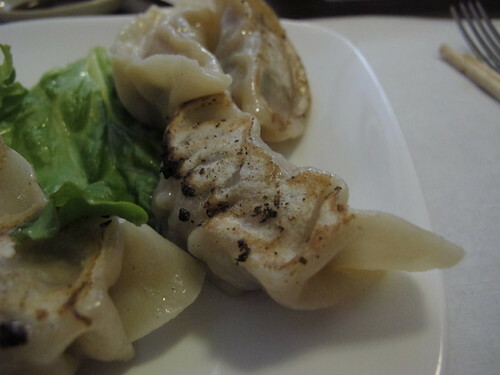 Some patrons may balk at the idea of eating a whole, broiled fish, but few will turn down a good gyoza. 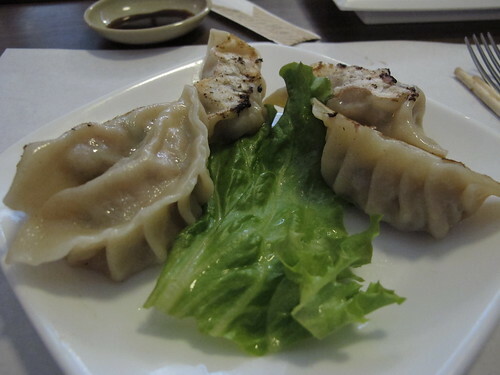 Instead of steaming or deep frying, Edo prefers a pot sticker approach to dumplings and it works quite well. With a filling of ginger, pork, and green onions, the flavors are well complimented by dipping sauce of rice vinegar, soy, and chili oil. 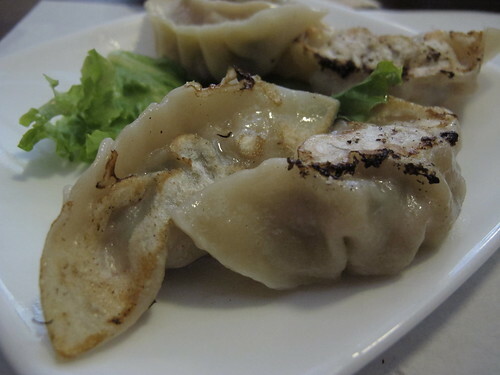 The slightly charred bottoms of the gyoza were an especially nice touch. Although I wasn’t particularly in the mood for nigiri sushi or hand rolls, I wanted to see how Edo stacked up so it was one temaki or salmon skin hand roll for me. 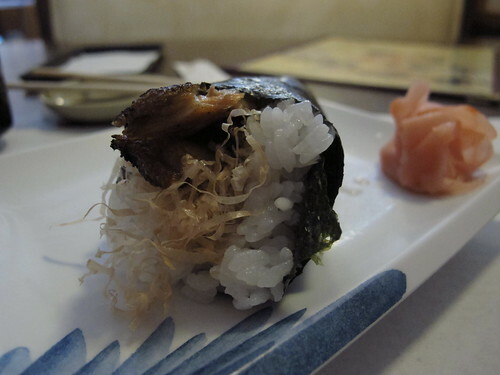 A sterling example of Japanese frugality, a salmon skin rolls puts to use an otherwise discarded piece of fish. 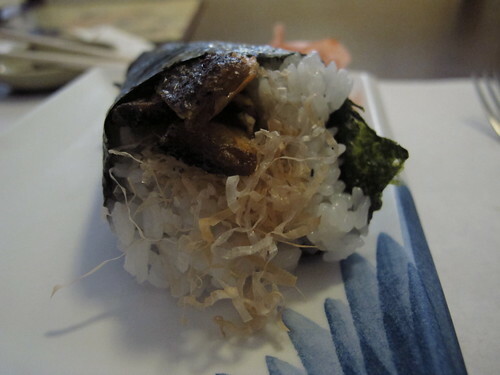 However, I’ve never seen it in a hand roll before this meal. Little did I know, but char grilled salmon skin, shredded katsuobushi, and the slight vinegar taste of sushi rice turned out to be superb combination. The delightful crunch and oiliness of well grilled salmon skin with the unmistakable flavor of katsuobushi was simple and captivating. Often reduced to little more than a complimentary item, miso soup deserves better. How did Edo treat the icon of Japanese cuisine? 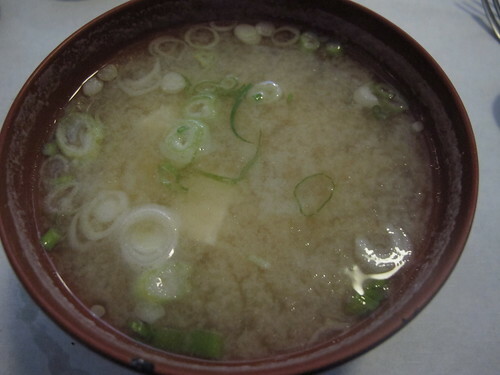 Plenty of sliced green onions and shiro miso fill out this miso soup but, strangely, no wakame. 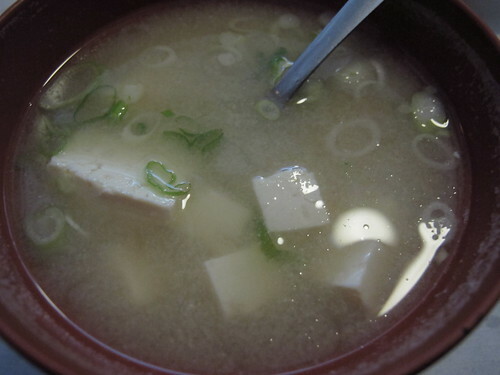 It may not have the deep flavors of a homemade niban or second dashi, but it did have more of the firm tofu instead of silken. 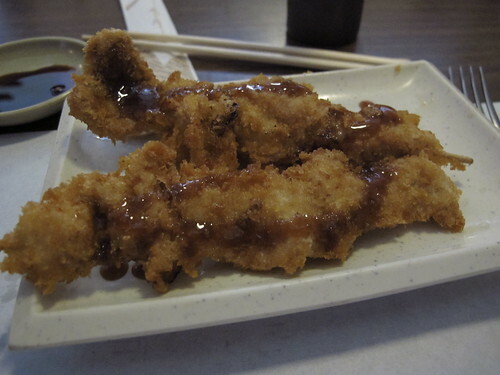 While the miso soup had driven me past the breaking point, I couldn’t help but be intrigued by the appetizer named kushi-katsu. 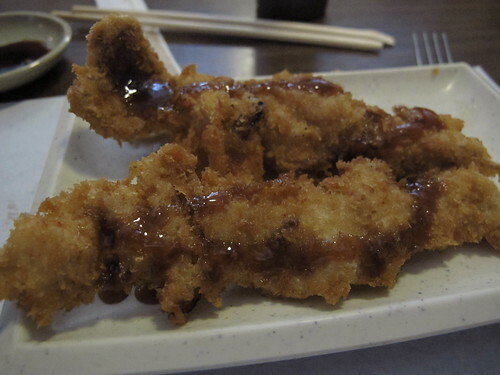 The idea of combing kushiyaki and tonkatsu was great, but the execution needed a little work. 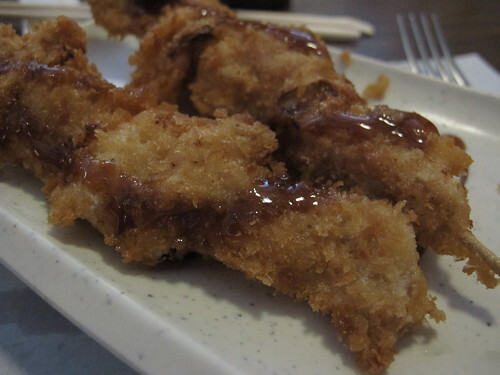 True to its name, there was plenty of panko coated fried pork with a drizzling of sweet and sticky tonkatsu sauce. Unfortunately, these pork kushiyaki turned out quite greasy with the pork having a distinct onion flavor. So often the case, I had to leave Edo with much of the menu left untried. There was simply no room to try the various ramens and donburi not to mention the rolls, nigiri, and hot pot. However, from what I did order, I can see why Edo has endured for nearly three decades. 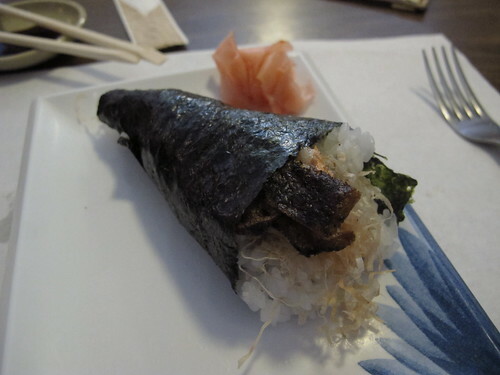 It may not have the glitz and glamour of a brand new restaurant, but Edo serves up well prepared home-style Japanese cuisine and if I lived closer to Memphis, I would brave Summer Avenue on a weekly basis if only to have another hand roll. Been eating there since not long after it opened, at least since about 1986. Haven't tried it but once in the last 10-12 years, and may need to do so again. My prior verdict: Good but not very good much less great.